This NEW test allows for the detection of a single drug in human saliva. Compared to the price of multi-panel saliva drug tests, it is cost effective if you only need to test for one drug! This test is intended for forensic use only. This is a single panel oral test that tests for Marijuana in human saliva. This is a single panel oral test that tests for Cocaine in human saliva. This is a single panel oral test that tests for Opiates in human saliva. This is a single panel oral test that tests for Methamphetamines in human saliva. The Oral Fluid single panel test is a rapid chromatographic immunoassay for the detection of a single drug in human oral fluid. This assay provides only a preliminary analytical test result. A more specific alternate chemical method must be used in order to obtain a confirmed analytical result. Gas chromatogrpahy//mass spectrophotometry (GC/MS) is the preferred confirmatory method. Clinical consideration and professional judgement should be applied to any drug of abuse test result, particularly when preliminary positive results are used. Oral fluid is not classified as biological hazard unless derived from a dental procedure. The used collector and Midstream should be discarded according to federal, state and local regulations. Store as packaged in the sealed pouch at 2-30°C. The test is stable through the expiration date printed on the sealed pouch. The test Midstream must remain in the sealed pouch until use. DO NOT FREEZE. Do not use beyond the expiration date. Allow the test Midstream, specimen, and/or controls to reach room temperature (15-30°C) prior to testing. Instruct the donor to not place anything in the mouth including food, drink, gum or tobacco products for at least 10 minutes prior to collection. Remove the test midstream from the sealed pouch and use it within one hour. Take off the midstream cap and insert the absorbent wick to the mouth, putit under the tongue to collect oral fluid until the control line appears. Put the midstream cap back outside of the absorbent wick and place the test midstream on a clean and level surface. See illustration below. Two lines appear. One color line should be in the control region (C), and another apparent color line should be in the test region (T). This negative result indicates that the drug is below the cut-off level. The intensity of the color in the test line region (T) may vary depending on the concentration of drugs present in the specimen. Therefore, any shade of color in the test line region (T) should be considered negative. One color line appears in the control region (C). No line appears in the test region (T). Control line fails to appear. Insufficient specimen volume or incorrect procedural techniques are the most likely reasons for control line failure. Review the procedure and repeat the test with a new Midstream. If the problem persists, discontinue using the test Midstream immediately and contact your local distributor. The Oral Fluid test provides only a qualitative, preliminary analytical result. A secondary analytical method must be used to obtain a confirmed result. Gas chromatography/mass spectrophotometry (GC/MS) is the preferred confirmatory method. A positive result indicates presence of the drug or its metabolites but does not indicate the concentration of drug in the specimen or the route of administration. A negative result may not necessarily indicate drug-free specimen. 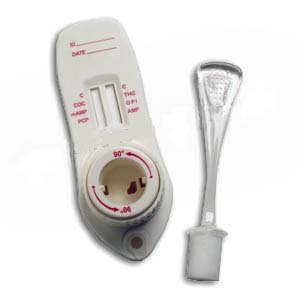 Negative results can be obtained when drug is present but below the cut-off level of the test.